In case we ever do reach the point of a flu pandemic, these essential oils, especially oregano essential oil, will be my weapon. Besides the usual remedies,of Oscillococcinum , and Dolivaxil, which always work, I’ve found an even cheaper way to fight the flu and ease an achy tummy. Peppermint 100% Pure Essential calms an upset stomach. You can drink the tea if you have some… or you can use the oil. Mix one or two drops of peppermint oil with 1/4 cup of olive oil. (The essential oils must be diluted before they touch skin; they are too strong for skin contact.) Rub this on your belly, and you will soon notice an instant feeling of release in your belly. This is GREAT for kids; they want to be touched and cuddled anyway when they’re sick, so they love having you rub their belly with the great smell of peppermint. Peppermint is so soothing, that even the smell alone will calm an upset stomach. Oregano Oil is a known anti-viral, anti fungicide and anti-bacterial agent. Oregano oil has a bitter, medicinal smell, too harsh for direct contact with the skin, and you only need a tiny bit of this powerful oil. I mix one drop of oregano oil with the olive oil (just add it to your mixture above) and the oil will soak into your belly and kill the bugs that are swarming around your belly. I’ve even used oregano oil to get rid of the effects of a “bad meal,” that left me sick. Cinnamon oil is a natural anti-viral oil that you can add. The anti-flu formula pre-mixed with cinnamon, nutmeg and thyme is known as the Oil of Thieves. 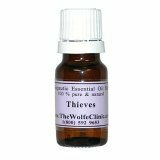 The reference to thieves is not because the oil “steals your sickness,” rather this is related to the legend of the band of thieves who raided houses during the Black Plague during the 17th century. The thieves were stealing from the sick, surrounded by the plague, yet never became sick themselves. The thieves were caught, and appeared before the judge. “How have you escaped the great plague?” he wanted to know. The thieves were actually from a long family of perfumers who knew the power of oils, and covered themselves with the “Oil of Thieves” to protect themselves. Just a note on essential oils. The bottles are small, and inexpensive. You only use a drop at a time, and they last for years. They are a great investment, and they work so hard. Our naturopath was just mentioning the oregano oil too, when I took Lexi in on Friday. Great advice. Peppermint and chamomile tea are staples around here, as well as a lemon/ginger tea. All good for tummies. Some alternative physicians recommend doing a mild laxative when a flu or cold starts, just to give a boost to your body’s desire to clean things out (which is what all that mucus and fever is for!) Aside from food choices (prunes and prune juice) you can also use Milk of Magnesia.